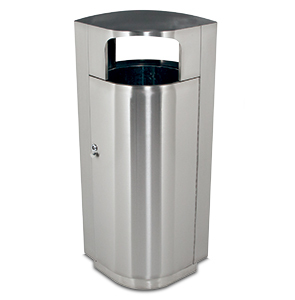 Includes removable galvanized liner with built-in handle that easily slides out for disposal. Grab Bag™ clips on liner secure trash bag in place and rubber guard on liner protects floors. ►Need a Waste Receptacle Fast? 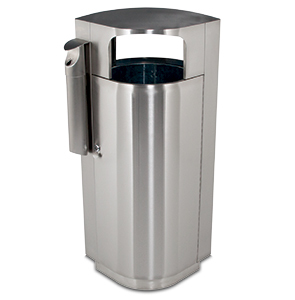 These beautifully designed Leafview stainless steel waste receptacles help keep any environment clean while providing an ergonomic way to dispose of waste. Completely constructed of heavy-gauge 304-grade stainless steel to stand up to the toughest weather conditions, along with locking door for easy waste removal. Door swings fully open to easily remove the liner. Locking door keeps liner secured and your personal discards contained within the trash receptacle. A key is included and additional keys can be ordered to keep on hand. 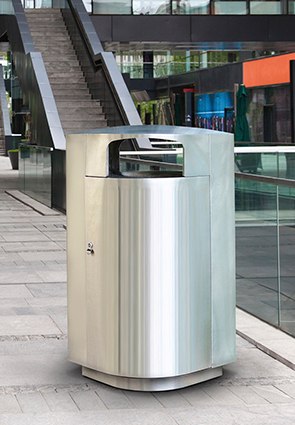 Covered receptacle keeps weather elements out and two large openings on either side provide convenient access for discards. Built-in storage compartment for extra trash bags provides easy maintenance and saves time. Bolt-down hardware included to secure trash receptacle to the ground.